One of the best fringe benefits of being a gardener is that one gets to spend a lot of time outside and, while out there, one can also observe the wonderful world of Nature. And, of course, one of the best parts of the world of Nature for me is the part that has feathers. 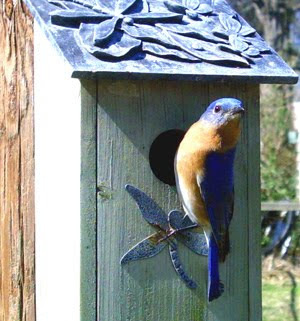 Observing Nature in my yard this week has meant observing bluebirds. 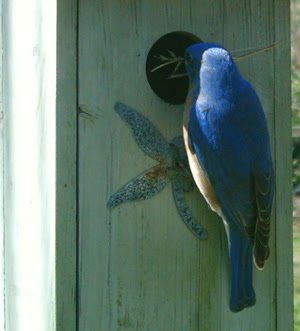 A pair of Eastern Bluebirds has been scoping out the yard, looking for a likely spot to raise their family. 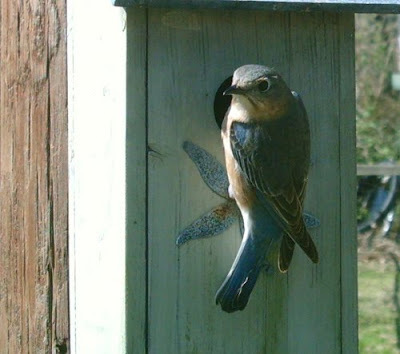 I have two bluebird boxes in my yard and, eventually, they seemed to settle on one of them. Here is the male of the pair doing a preliminary check of the house. The pretty little female also came to look it over and give it her stamp of approval. They must have decided the box would meet their needs because here is the male delivering a beakful of nesting material. Come to think of it, I'm not so sure being able to observe Nature is a "fringe" benefit. It may, in fact, be the MAIN benefit of gardening. At least, for this gardener. What a gorgeous day this has been here in my little corner of the world. I hope yours has been equally sun-filled and beautiful and that you were able to get outside and play in it for at least part of the day. Here at the end of February, while I'm still digging, dividing and moving perennials and some shrubs around to various parts of my garden, it is time for me to start thinking seriously about my spring vegetable garden. While all those other parts of the garden have claimed my attention, the fall/winter veggies have been coming to the end of their run, except for the beets and carrots that still have a way to go, and now it's time for the changing of the seasons. A month ago, I planted some 'Russian Banana' (Note: Corrected from 'Yukon Gold'.) fingerling potatoes, but, as luck would have it, they have never come up. I'm really afraid they have rotted in the ground. We had quite a lot of rain just after I planted them. I also purchased and planted a few extra asparagus crowns, but other than those small efforts, I haven't planted any other vegetables yet. I know that some in the area start their spring veggie gardens in February, but that is just a little too soon for me. I don't really want to have to protect the tender plants from frost, so it's better for me to be patient and wait until the calendar turns over one more time. Meantime, there's a lot to do to get ready. My vegetable beds are actually in much better shape than they have been in some years, so there's not a lot of cleaning up to do - just pull a few weeds and rake the soil, or in some cases turn the soil. Add a little compost or well-rotted manure and work it in and I'm all set. All I need is seeds or plants. And just a smidge warmer weather. I usually have pretty good luck with spring and summer vegetables. Indeed, the garden generally produces more than my family can possibly use of tomatoes, peppers, eggplants, green beans, squash and corn. These few weeks before the beginning of the new gardening season are like spring training in baseball when every team is a winner and anything is possible. Every pitcher is a potential 20-game winner; every team can be a World Series champion. It's the same for gardeners - anything is possible. In my mind's eye, I see a garden of perfection, a trophy-worthy garden. Luscious plants with shiny tempting fruit and no yellow leaves or insect or disease damage. And no weeds. Ah, I can dream. On a day like this today, anything is possible. 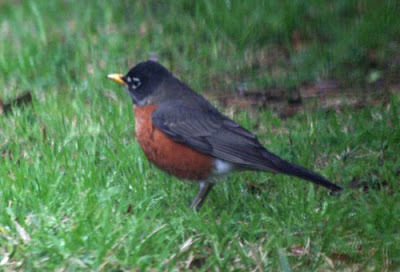 Color in the garden these days may be mostly provided by our feathered friends, especially by that harbinger of spring, the American Robin, as he races around the yard looking for insects to snack on. I have had large flocks of these beloved birds in my yard recently. At times, 100 or more are settled among the limbs of my trees or are exploring the grass and leaves on the ground. 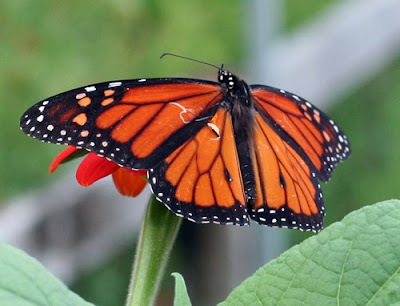 But, in addition to colored feathers, there are a few cold weather bloomers that can provide us with some much needed color as we round the corner into the last month of winter. 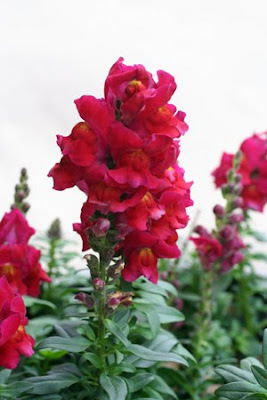 One of the oldies but goodies among the plants that will reliably bloom for us at this time of year is the snapdragon. 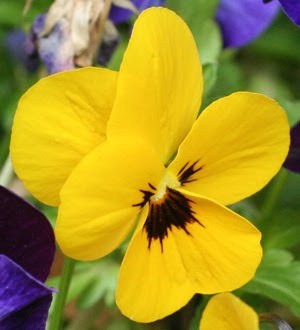 There are many colors available, of course, but this winter, I chose this one to brighten my yard. The plants are reaching their peak of bloom just now, when I need them most. These snappy little blossoms always make me smile to see them. 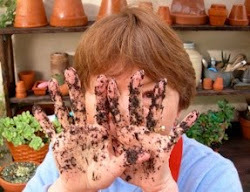 Lately it seems that I have been too busy actually gardening to sit down and blog about it. This past week has found me outside happily digging in the soil on most days. Much has been accomplished but much still needs to be done before spring. When the purple oxalis (Oxalis triangularis) starts raising its leaves above the soil, I know that winter must be on its way out the door, no matter how much it may kick and scream and try to hold onto the door jamb as it is evicted. Today, I transplanted 36 plants and signs of spring were everywhere. Every single plant that I dug and moved to its new location had tender new growth sprouting. 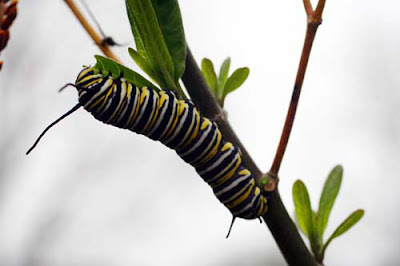 Even the butterfly weed plants (Asclepias curassavica) had green shoots coming up from the roots, giving me hope that they may again nourish a few more generations of these beautiful monarch caterpillars this spring, summer and fall. And giving me hope for the speedy return of the caterpillars' majestic and colorful parents. Meantime, while I wait for the new green growth to attain full size, and for the butterflies to return to my yard, I still have plenty of color here. Of course, most of my color just now comes with feathers. But it won't be long before that changes. Let Old Man Winter do his worst! Spring is on the move. It can't be stopped. Only delayed. 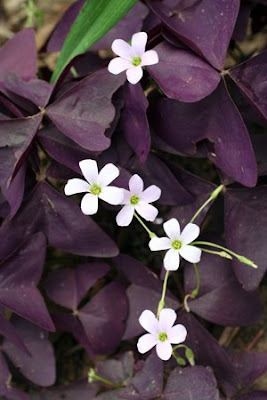 The last weeks of winter bring the emergence of the oxalis, both the pernicious weed that finds its way into almost every planting bed in my garden, as well as this somewhat more decorative variety with its pretty purple leaves. Both kinds of the plant have these delicate little pink blossoms. 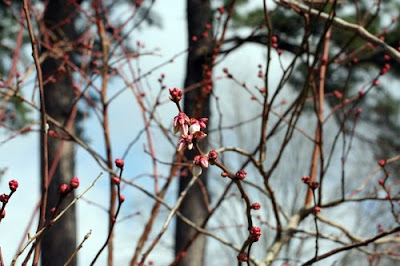 When we start to see these plants, we know that winter is on its way out the door. The day improved as it lengthened into evening and the sun came out to play. Having moped around the house during the drizzly and too-cool morning, I was anxious to go outside and join the sun. So much to do! Where should I start? I decided to do a bit of work in my neglected vegetable garden. There's not much going on there just now. The winter greens are almost gone. A few brave sugar snap peas are struggling up their trellis. The onions and leeks are looking a little pale and need to be fed and weeded. In truth, every bed in the garden needs to be weeded, so that seemed to be a good place to start. I decided to start on the west side of the garden and work my way east. That meant that I started with the sugar snap pea bed. I pulled weeds and propped up some of the little pea vines that had failed to grab the trellis. Immediately, I was transported to another time and place by the smell of the rich, damp dirt. In my mind, I was once again a child on a farm in northeast Mississippi where one of my earliest memories was of the smell of freshly turned soil in spring. Soil, still damp from winter rains and full of all the microorganisms that spend their lives in it, has that wonderful, unmistakable musty fecund smell, which is almost impossible to describe, but if you have ever smelled it, you will never forget it. As often happens, I had failed to put on my gloves and, within a few minutes of beginning my task, my hands were covered in the damp soil as I dug fingers into it to pull out the stubborn weeds. My hands soon smelled like the earth. I liked the feel of it between my fingers and under my nails. I liked the feeling of being one with the earth. I think that must be part of my DNA. It has frequently been observed that gardening has a lot in common with meditation, and nothing seems more Zen-like to me than the act of weeding. See the weed. Pull the weed. The mind floats free and blank, focused only on the act of weeding. It is both a tiring and a restful act, and at the end, when you can survey a clean bed that only has the plants that belong there, there is satisfaction and even exhilaration. I didn't progress very far on my weeding project today. I got one long raised bed and two shorter ones cleared. It's a start. The most important thing is that I spent some time with the sun on my face and dirt on my hands while the three Purple Martin scouts that have so far returned to my martin houses circled and chortled their encouragement overhead. The promise of a sunny weekend stretches ahead and by the end of it, I hope to have worked my way to the eastern side of the vegetable garden. Nirvana, or at least a feeling of accomplishment. Note: This could have been written today except that so far no Purple Martin scouts circle my yard. I'm looking for them every day, but so far there is no chortling encouragement from the sky. Where are they? What's all that yellow stuff spilling out of the sky and over my yard? What a beautiful week we have had so far. I hesitate to even mention it for fear of jinxing us, but four days of brilliant sunshine, even though it has been a bit chilly at times, were just exactly what the doctor had ordered for me. Finally, I've been able to get into my yard and start working on that list of backlogged projects and I have actually accomplished quite a lot. It feels wonderful! I was able to finish up putting in the new beds in the southeast corner of my backyard and, yesterday and today, I started moving some plants to them. Yes, it is still plant migration season in my yard. If this wonderful sunshine can manage to stay with us for just a few more days, it is possible that the migration will finally be complete. My big - and I do mean BIG - project that I'm working on now is to get two large esperanza plants and two gigantic brugmansias moved into the new beds. I've almost finished with that. One more esperanza to go, tomorrow. The esperanzas ("yellow bells"), one of which is seen here from last summer, were just too darned happy in the spots where I had placed them. They had overgrown and bullied all their neighbors and I decided it was time to give them more room. I'm not sure if they'll be any happier in their new locations, but I think I will. At least I shouldn't have to keep pruning them to keep them from overwhelming everything around them. The brugmansias, too, had simply overgrown their beds and one of them in particular was threatening to take over the world. 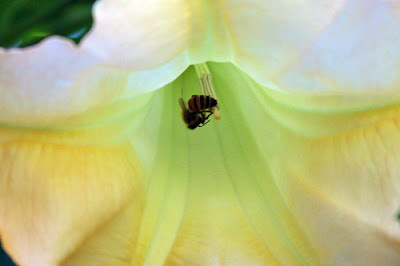 This large bell-shaped blossom, along with its friend the bee, grew on the brugmansia that was planted just outside my garage door. 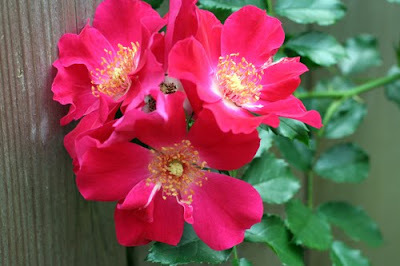 I loved going out that door at night last summer and encountering that heavenly scent. But the plant also stood just next to the gate to my backyard and it kept trying to block that gate with its limbs. The limbs were always getting damaged or broken by traffic through the gate. In its new spot, it will have all the room it needs to spread those limbs and no one will be running into them. Both the brugmansias and the esperanzas had died back to the roots after the winter freezes, but then they do that every winter. As I dug the plants out, preparatory to moving them, I was gladdened to see little green shoots coming up from the roots. More signs that spring really is on the way. My other big project this week has been pruning the roses and, of course, moving some of them. Last winter, I had moved this 'Dortmund,' one of my favorite antiques, but neither the plant nor I were ever very happy with the new placement. So time to pull up roots and move again. I'm also thinking of getting a couple of more 'Dortmunds' for the bed where this one is going. A little company of its own kind might help the plant feel even more at home, and as far as I'm concerned, one can't have too many of these wonderful roses. 'Graham' is another of my plants that is almost too happy where he is and he grows hugely every year, so every winter he gets drastically whacked back. Today was the day this winter. By the time a couple of months have passed, I hope he will have forgiven me and will be well on his way to producing more of these luscious yellow blossoms. I'm not nearly finished yet, so I'm hoping and wishing and crossing my fingers that this wonderful weather holds out just a little longer. By then, I'll probably be complaining because it hasn't rained in a week. Gardeners are never satisfied! This year's Great Backyard Bird Count is history, but we will have to wait until after March 1 for all the data reports to be finalized. Participants can still report their counts up until that date, so until then we won't know whether this will be another record-breaking year for the popular mid-winter bird survey. If I had to guess, I would say that this probably will not be a record-breaker. The severe weather in many places probably limited some counters' efforts, so we may fall a little short of the record of 634 species that were reported in the 2008 count. As for my own personal count, I ended the weekend with a total of 28 species, not a record-breaking year for me, either. There were several species that are regularly seen in my yard that did not show up during the weekend - birds like the little Ruby-crowned Kinglet and the Eastern Bluebird. I didn't even see a Black Vulture or a Red-tailed Hawk flying over my yard, even though in the usual course of events, I see them almost every day. Neither did the big Pileated Woodpecker or the little Brown-headed Nuthatch put in an appearance. I was pleased to encounter one unusual bird, the Yellow-bellied Sapsucker. Although these birds visit our area in winter, I almost never find one in my yard, so seeing one here was a great treat for me. When the final count is in, some of these rankings and numbers may change, but there is unlikely to be any great upheaval in the standings. For a look at all the various "top ten" lists, click here. The great folk/country song writer Jimmie Rodgers once wrote a song about "Peach pickin' time in Georgia." As far as I know, no one has ever written a song about "Rose prunin' time in Southeast Texas," but if they had, this would be the time they would have been writing about. Valentine's Day in our part of the world is the traditional time to do your rose pruning. I missed the target date by a few days, but I was out there with my Felcos and my loppers today getting the job done. 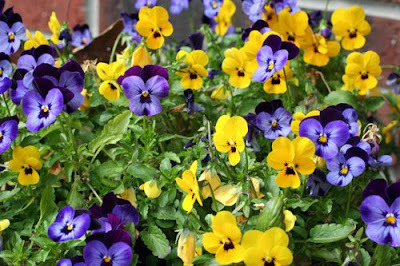 Actually, I had started well over a week ago when I moved my 'Old Blush' and some 'Sunny yellow Knockouts' that were in unfortunate placements. Since I was moving the plants and thus disturbing, and, in the case of 'Old Blush,' pruning, their roots, it made sense to go ahead and prune the tops as well. I hope all the plants will forgive me for getting a little ahead of schedule. 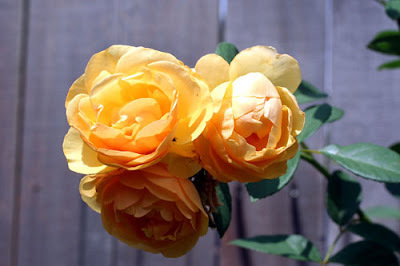 As I was pruning the 'Knockout,' I meditated on several recent entries around the gardening blogosphere concerning 'Knockout' roses. The writers of these blogs have been very critical of the 'Knockouts' and I have struggled to understand their reasoning. I guess I have failed, because it appears to me that their main criticism of the roses is their lack of problems and the ease of their culture! It's as if a rose is not a "real" rose unless it gets blackspot and requires constant babying. These are the same kind of people, I think, who excoriate the 'Stella d'Oro' daylily or liriope or crape myrtles because they are so common. They are, in short, plant elitists. To put it even more bluntly, they are plant snobs. Not that there is anything wrong with that. Some people get a thrill out of being plant snobs and specializing in growing difficult plants and that's okay. To each his or her own, but personally, I can't afford that kind of elitism. I'm just not that good a gardener. 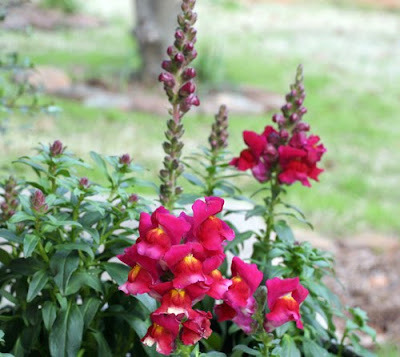 So, just leave me alone with my 'Knockouts' and my antique roses and petunias, daylilies, crape myrtles, and liriope and my other common plants, and I'll leave you alone with your elite plants that I've probably never even heard of. The gardening world is a big one and there is plenty of room for all kinds of plants. And gardeners. For Garden Bloggers' Bloom Day in January, I had nothing. Literally, nothing. It was embarrassing. I'm a little better off this month. I do have a few blooms and some soon-to-be blooms to share. So let's get right down to business. Uh...yeah. I haven't completely lost my mind. 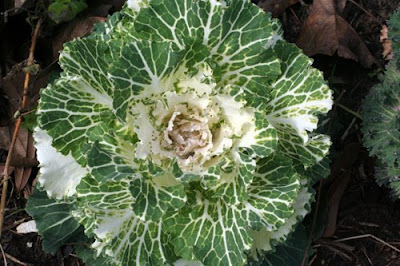 I know this ornamental kale isn't a bloom, but it is sort of bloom-shaped, don't you think? And I'm stretching the definition of "bloom" just about as far as I can this month. 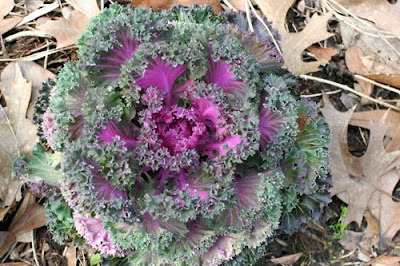 And if I include the purple kale, of course, I must include the white, as well. My 'Ice Follies' daffodils have been promising me blooms for days now. I was just so sure they would be open by Bloom Day. Well, the joke's on them, because they get included anyway! Here's another late bloomer. A really late bloomer. 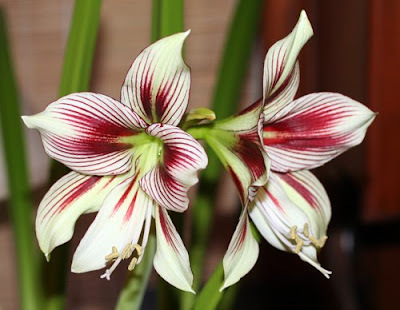 I purchased this amaryllis to bloom for the end of the year holiday season. Obviously, it was confused about which holiday it was supposed to show up for and it opened, finally, just in time for Valentine's Day! 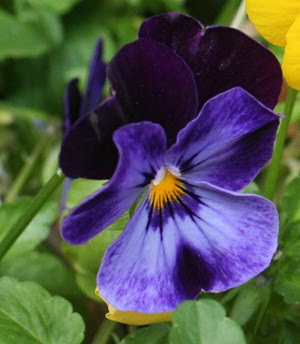 I've tucked in violas anywhere I can in the yard, just because I love them so. These greet visitors at my front door. Who could resist this sweet little face? 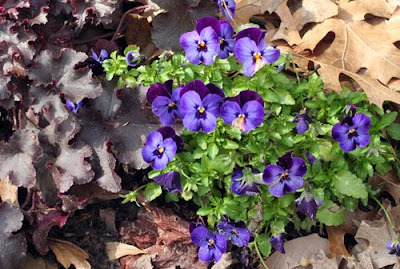 These violas snuggle up next to the 'Coral bells' heuchera in the shade garden. 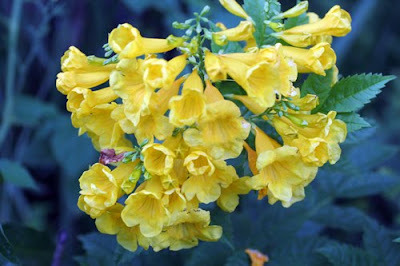 The colorful snapdragons by my garage door have helped to lift my mood on some of the gloomiest of days. 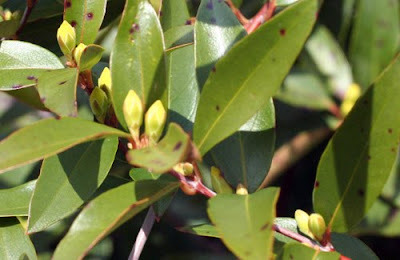 The Carolina jessamine would normally be in full bloom by now, but this year it is keeping those buds closed tight just a little bit longer until it is absolutely sure that the coldest weather has passed. 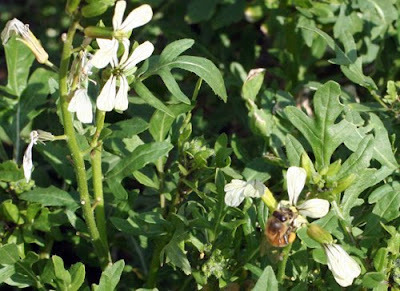 In the veggie garden, some of the arugula is beginning to bolt and go to bloom and the bees are very grateful. Considering the sharp, somewhat bitter taste of arugula, you wouldn't necessarily expect the bees to go for its blossoms, but you'd be wrong. They love them! 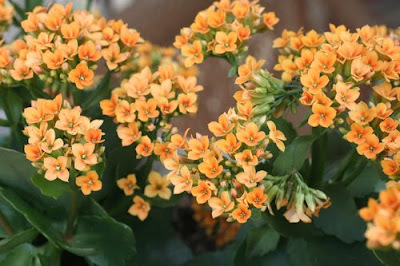 I really like this yellow kalanchoe that blooms in my back porch planter. What a cheery color, and goodness knows, we need all the cheer we can get these days. 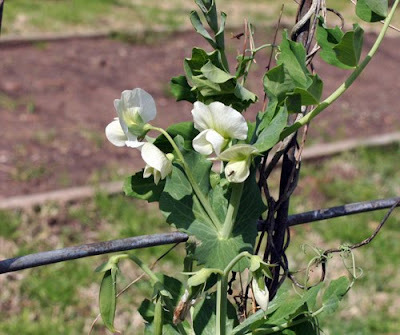 Back in the veggie garden again, the snow peas are still lifting their pretty little white blossoms on the trellis. 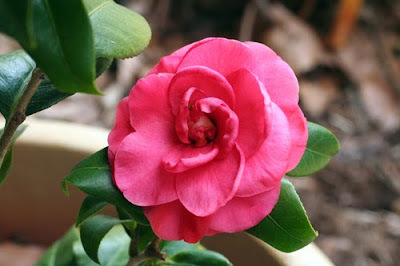 I don't know this camellia's varietal name but I love it just the same. It never fails to make me smile. The blueberry blossoms are not quite fully opened yet, but close enough for this Bloom Day. They hold the promise of spring to come in their half-opened blossoms. 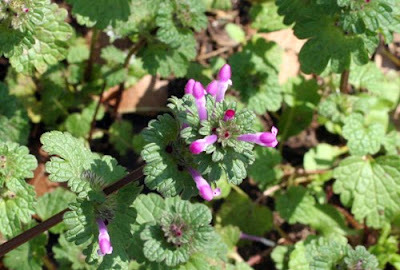 This is the bloom that I have the most of in my garden at the moment - henbit! It is a pernicious weed, but it is actually kinda pretty when it blooms. I might as well say that, because I'm never going to be able to get rid of it. By the time next Bloom Day rolls around, we will have almost made it to the magical date of the vernal equinox. Spring, glorious spring! It can't come soon enough for me. Check out the links to other Bloom Day participants at May Dreams Garden. You'll see some much more floriferous gardens than mine and I'll bet you won't see one of them that had to resort to featuring a picture of henbit! Vegetables are suddenly the biggest thing going in the world of gardening. The last year has spotlighted the reemergence of the "Victory Garden" as a factor in American life. This was helped along, of course, by the First Lady's efforts to establish a vegetable garden on the White House lawn, but there were many other factors that contributed to its renewed popularity. Chief among these may have been an economy that made it important for people to save money where they could and growing some of what you eat can certainly help with that. Also, there is the heightened awareness of the need to eat healthier and, again, vegetables are a big part of any healthy-eating plan. Growing vegetables is a relatively easy kind of gardening, but for someone who has never done it, the prospect can be a bit daunting. The National Gardening Association suggests there are five rules that can help the uninitiated get started. 1. Site: Choose a site that is close to your house or to a walkway so that it will be convenient for you to visit your garden every day. Tucking a vegetable garden away in some hidden corner of your yard is a blueprint for failure. Such a garden is too easily overlooked and forgotten. A vegetable garden needs to be weeded, watered and harvested on a regular basis and convenient placement makes that much easier. Related to the selection of a site is the requirement to have that site close to a water source to make the needed watering easier. 2. Sun: Also related to site selection, you will need to make sure that your site gets 3-6 hours of sun daily, and preferably closer to the upper end of that time range. You need to take into consideration any shade that may be cast by buildings and other structures and by trees. 3. Soil: Actually, this probably should be listed first, because everything springs from the quality of the soil. A healthy soil with plenty of organic matter incorporated and proper drainage is absolutely essential to growing a successful vegetable garden. 4. Selection: This may seem self-evident, but grow what you like to eat. If you don't like turnips or broccoli, don't try to grow those crops. Grow carrots and snow peas instead - that is, if you like carrots and snow peas. Growing things that you enjoy eating will just make your gardening a much more rewarding experience. It also helps to grow a variety of flowers and herbs along with your vegetables. Mixing them all together in the garden makes for a more beautiful garden and will make time spent there more pleasant. Also, it can be helpful in controlling garden pests. 5. Size: Finally - and, again, this could really be number 1 - start small. Planting more than you have the time and energy to take care of is a formula for frustration and failure. Remember, you can always make your garden bigger if you find that you have underestimated. You can even grow many vegetables in containers, if you live in an apartment or your space is limited. Just get the biggest containers that you can manage. Your vegetables will appreciate the room to stretch. There are few things that are more satisfying in gardening than growing food for yourself and your family. It really is true that nothing tastes better than a vegetable you have grown yourself. Here at mid-winter is a good time to start planning your veggie garden. The weather is still too inclement to do very much outside, but some preliminary planning can make everything go a lot smoother when you finally can get outside to get your garden started. That time will arrive sooner than you think, so time to get planning so that then you can get planting! 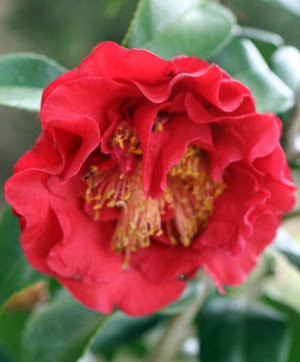 Queen of the winter garden in the South - the camellia. Some start blooming in late fall. 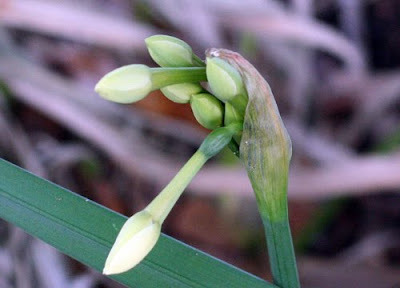 Some bloom in early winter. This one, whose name I don't know because it was mislabeled at the nursery, blooms in mid to late winter, just when we need it most. "Do you want a banana tree?" my neighbor Virginia asked. Virginia is a very generous neighbor who enjoys sharing her extra plants with me and I enjoy receiving her extras. Thus, we have the perfect symbiotic relationship. I admit I was given pause by the idea of the banana tree. I hadn't really planned on a banana tree and on the spur of the moment, I couldn't think where I would plant it. But my standard motto is "Never say no to a free plant" so the issue was never really in doubt. Yes, I wanted the banana tree. For a couple of weeks now, I have been working on putting in a long-planned new bed along the ugly chain link fence that separates our backyard from our neighbor on the north. The fence is perhaps fifty feet long and I have completed work on the bed for about half that distance. I have been moving plants from all over the yard to fill the bed. It is a good site for a planting bed because most of it is in sun for much of the day. Only the section near the old apple tree gets some shade. I'm hoping to move an azalea from the front yard to that particular section. Giving thought to the problem of what to do with the banana tree, I soon decided that a section of that bed that gets sun eight to ten - or more in summer - hours a day would be the best place for it. Virginia told me I would have to bring a cart to her house to pick up the tree. (She lives a couple of houses down from me.) It was too big and heavy to carry. Since the garden cart was otherwise engaged at the moment, I opted for my husband's pickup and drove over to receive my new passalong plant. The tree, along with its brothers and sisters that had sprouted from the mother tree, had been pruned back and dug from the ground. It had two pups attached to it. Virginia's husband and I wrestled it onto their wheelbarrow. It was full of water and weighed a ton. (Well, maybe not a ton, but it was heavy.) He pushed the wheelbarrow out to the pickup and we offloaded it into the back of the truck. While we were doing this, they told me that they harvest bananas from their trees every year. They weren't sure what variety the tree is, but, obviously, it is acclimated to this area and it is productive, so what more do I need to know? I did do a little research on the needs of banana plants before I got around to putting it into the ground. The first thing that I learned was that a banana tree is not a tree at all but a large perennial herb. And yes, they do like lots of sun, 12 hours a day being optimal, and they like good drainage. It sounded like I would be able to provide exactly what my new tree - er, herb - liked. Happy with the site I had chosen for the plant, I slid it off the truck and into my wheelbarrow and carried it to the bed where I had dug a large hole to receive it. There, I reversed the process by sliding it off the wheelbarrow and into the hole. Holding the trunk upright, I firmly tamped the soil around it and stood back to admire my handiwork. Then I turned the hose on just a trickle and left it on the bed to slowly water the plant in over several hours. Did you know that the banana is America's favorite fruit and that the average American eats 30 pounds of bananas a year? Just another interesting fact that my research turned up. I like bananas, too, and I always thought it would be fun to grow my own, but I've never tried before. Now I am excited to have my very own tree (herb) and I look forward to harvesting some luscious fruit from it. It will taste even better because it was a passalong from a sweet neighbor. It was from that Wordsworth poem that, as a child, I learned my romantic view of daffodils. They were the essence of poetry, the essence of spring, beauty itself. What is learned as a child stays with us, even if it sometimes gets buried among the later detritus of our psyches. 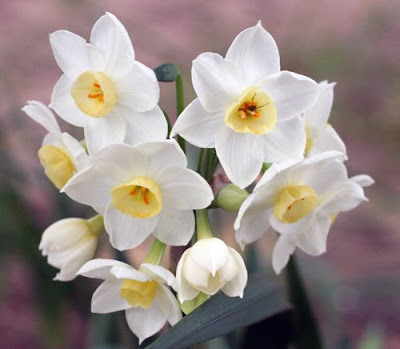 And so it is that I have retained my love of that schmaltzy - by today's standards - poem, as well my love of daffodils, surely one of Mother Nature's schmaltziest flowers. When I attended the Houston Bulb and Plant Mart last year, I was enthralled by all the pictures of beautiful daffodils in the bulb house. The variety of bulbs was astounding and, supposedly, they would all grow in our climate. Now, my record with daffodils in this climate is less than stellar. Occasionally, I have managed to coax a few blooms from them in their first winter or spring, but almost never do they return the following year. Since planting bulbs is a painful chore for me, I'm not really interested in going to all that effort for a plant that is going to be an annual. And yet... I see with my "inward eye" the dance of those ten thousand golden daffodils upon the hill...and my heart melts. Maybe I could try just one more time. Just a few bulbs. And so, in the end, I did buy a few bulbs. I chose 'Ice Follies.' It could have been any one of several others that were recommended to me, but time was growing short and I needed to choose. 'Ice Follies' was close at hand. I brought my small bag of bulbs home and planted them around the birdbath in the front yard. I dreamed of them making a cheery late winter display for passersby. Then I waited. Finally, the greenery came up, but no buds or blooms. Things didn't look promising. No dancing ten thousand daffodfils for me. Not even ten. And so it was with some surprise that when I filled the birdbath a few days ago I noticed there seemed to be some suspicious swellings on the tips of some of my daffodil greenery. I looked closer. Buds? Buds! So maybe 'Ice Follies' just blooms a little later than I thought. Okay, it's not exactly a "crowd of golden daffodils" but it's a start. Those swelling buds have given me hope. That's all we romantics need to fuel our dreams. I estimate that, over the years, I have made just about every mistake that it is possible for a gardener to make. In the process, I have killed an awful lot of perfectly good plants. During the last four or five years, I have set about trying to rectify some of my earlier errors. Those were landscaping mistakes that were made in the late ‘80s and the ‘90s. During that time, my job and my kids took just about all the energy I had and any time left over for gardening was very hurried. The resulting landscaping was particularly slapdash. Without proper planning, I used a lot of plants that shouldn’t have been used and that I would never use if I were doing the whole thing over again today. A lot of those plants are still in my yard. They are perfectly good plants and it isn’t their fault that they were misused. As you may surmise, I get very sentimental about my plants, even the bad boys, and I find it hard to let them go. So, instead of “sunning their roots,” I have employed the strategy of moving them to other areas of the yard. As it happens, most of these inappropriate plants are in my front yard and I’ve been moving them to the backyard. I did actually manage to say goodbye to two old crape myrtles that I had in the front yard. They were too big to move and they were misplaced and interfering with my plans for the future, so they had to go. We (and when I say “we” I mean my husband) did sun their roots, but all the other shrubs, no matter how big, are getting dug up and relocated. I’ve written here before about the bed I’ve been building along the chain link fence that separates our yard from the neighbors. It is a big bed, approximately 80 feet long, and it takes a lot of plants to fill it. Fortunately, I have a lot of plants; they are just in the wrong place. So far, I’ve filled about half the bed with transplants from other parts of the yard and with that passalong banana I got from my neighbor. Today, it was time to move the variegated privet from the front yard. Yes, I admit it. At some point in the ’90s, I actually thought it would be a good idea to place two variegated privet shrubs on either side of our bedroom window and on either side of the azalea that was planted directly under the window. What was I thinking? Well, obviously I wasn’t thinking about how big these little shrubs would grow some day. In time, they towered about ten feet tall and almost that wide, crowding out other plants in the bed. I had to keep whacking them back to maintain any semblance of control, but nothing slowed them down for long. These are very hardy plants! In addition, I think they are attractive plants. That’s probably why I bought them in the first place. Evergreen, or at least ever-gray with that variegated foliage, they seemed like perfect screening plants for the area that I’m trying to hide with my new bed. So today, out came the shovels, and we started digging these huge shrubs up so they could be moved. I expected resistance, but, in fact, it was surprisingly easy. They have relatively shallow root systems, although the roots stretch over a wide area. In practically no time, they were out of the ground and on their way to their new home. This afternoon, I tucked them into their new bed and gave them a nice long drink of water. They were SO dry and thirsty. Afterwards, I stood back and admired them. I like the way they look in their new spots. Now if I can just manage to keep them alive until their roots settle in and start delivering sustenance to the new growth, they will reward me by screening a very big portion of that ugly fence. Another gardening mistake corrected. I knew there was a reason I bought these plants. Migration season continues in my garden. Plants are "migrating" from one bed to another just about as fast as I can get my shovel into the ground! Today it was the 'Big Momma' Turk's cap, 'Old Blush' rose bush, and two hibiscus plants that had been living in pots which took flight from their old homes to new spaces. I trust they will all be happier in their new digs. This is the time of year when it is most efficacious to move many plants. The plants are in their dormancy and the weather is cool to cold, which reduces the stress on them when they are moved. The weather forecast for the coming week promises cold nights and cool days all week. Moreover, the moon is waning which is considered to be a good time to do transplanting. What more encouragement does an inveterate plant mover like myself need? None! So, tomorrow, I plan to be out in the garden early with my shovel moving things hither and thither. And possibly even yon! As we all know, a garden is never finished. There are always improvements to be made, and, in my garden, very often those improvements involve moving a plant to a bed where it will be happier. I have admitted here before that I almost always seem to get it wrong the first time 'round. Usually, on the second or third move, if I haven't killed it by then, I manage to actually get the plant where I want it to be. What must it be like to be such an accomplished gardener that you actually know immediately where a plant should go in the landscape? You dig a hole, drop the plant in, and it lives there for the rest of its life. Yes, what must that be like? It is beyond my wildest imaginings! As I walked into my yard early this morning, I saw a giant moving shadow. No, it wasn't a groundhog. It was the shadow of a flock of hundreds of blackbirds that rose up from my lawn and flew off down the street. Never mind that I don't have a groundhog - the blackbirds are a more reliable predictor of mid-winter and the coming of spring. When they start gathering in huge flocks and descending on our yards to scrounge birdseed or whatever else they can find to eat, we know that winter has reached its peak and it is all downhill toward spring from here. And now, as we head into this downhill sprint over the next six weeks, we gardeners will be in a race with the sun, as it heads back north along the horizon after a winter in the southern skies. As our planet's wobbling orbit slowly begins to tilt the northern hemisphere toward the sun, our days get longer and warmer and one morning we will wake up and open our front door to a blast of hot air. Then we'll know that summer is here - probably around April Fool's Day! But from Groundhog Day until April Fool's Day, we gardeners of Southeast Texas have a window of opportunity. These are the halcyon days of pleasant and calm weather when we hurry to try to get our major projects of the year completed before we are immobilized by the summer heat. It is the busiest and, in many ways, the best time of the year to be in the garden. The days are mostly of tolerable temperatures and humidity except when a chill wind blows, or we are wrapped in a foggy mist for much of the day. It is a time when it is possible to work hard in the garden for most of the day without being uncomfortably drenched in sweat and perhaps having to change your tee shirt a couple of times during the day. It is a time to just enjoy being outside and playing in the dirt. Working outside today, I could hear the sounds of spring coming all around me. Cardinals, mockingbirds, wrens, chickadees, and robins were all practicing their spring songs. And the woodpeckers were practicing their drumming. Once, as I was transplanting some foxtail asparagus fern to a bed under the red oak tree, I heard a very faint sound of a woodpecker drumming. It sounded as if it were coming from a great distance and yet the sound seemed to be emanating from somewhere on my tree. I squinted up through the bare branches and finally located the source - a tiny Downy Woodpecker drumming very gently, almost as if he were humming to himself, practicing his chops before the big show. Very soon, he'll be onstage for real and will be drumming hard to attract a lady woodpecker and to proclaim his territory, but today he just seemed to be playing, enjoying himself in the sun. It made me smile to see him there, and especially, it made me glad that I was there to see him. On days like this, it is good to be a gardener. "If it came from a plant, eat it. If it was made in a plant, don't." I have long admired Michael Pollan's practical, common-sense approach to food and gardening and, in fact, to most things on which I've heard him express an opinion. He has, of course, long been a champion of whole foods (the actual foods, not the grocery store), growing one's own foods when possible, and shopping at local farmers' markets when it isn't possible. He's also a champion of home cooking - cooking those real foods you have raised or purchased rather than popping a frozen, preservative-laden dinner into the microwave. The bottom line is if we all followed Michael Pollan's common-sense advice we would be a much healthier society. As it stands, statistics will show that societies that rely on the so-called Western diet of processed foods, added fat, sugar and refined grains and heavy on the meat suffer from high rates of the so-called Western diseases: Type 2 diabetes, obesity, cancer and cardiovascular disease. On the other hand, people who consume traditional diets that are not full of such foods do not suffer these diseases at such a high rate. Recently, Pollan has boiled all of his rules of healthy eating down to their essence and has published them in a thin volume called Food Rules: An Eater's Manual. It lists 64 principles of good eating in a easy to follow and understand format. Pollan's rules are deceptively simple - things like doing all of your eating at a table and paying attention to what you are eating. In fact, one of the biggest expanders of the American waistline may be our habit of eating while working at our desk, watching television, or driving. Multi-tasking, of which many of us are so proud, is not really conducive to doing any one task well, and that includes eating. And what did your mother always tell you about eating? "Eat slowly and chew carefully." Pollan agrees. He adds that we should practice portion control and eat to the point of satiation, not fullness. At the same time, Pollan says that "Special occasion foods offer some of the great pleasures of life, so we shouldn't deprive ourselves of them, but the sense of occasion needs to be restored." In other words, every day is not an "occasion." Not every day calls for chocolate-covered cherries. In fact, Pollan is a proponent of the so-called S policy: "No snacks, no seconds, no sweets - except on days that begin with the letter S."
Over the years, Pollan's previous books on food and nutrition, In Defense of Food: an Eater's Manifesto and The Omnivore's Dilemma have contributed to the popularity of the "slow food" and "locavore" movements, as well as given added impetus to the growing popularity of backyard vegetable gardens. With any luck, this new book of his may add to that momentum. This little book is only 139 pages long and it only costs $11, but if you read it and adopt its principles, it could have a very big impact on your life and your health. It could turn out to be about the best $11 you ever spent. I get no commission, kickback, or remuneration for saying that. Just the satisfaction of having steered you, dear reader, onto a healthier path through life. What did your own personal groundhog have to say about the prospects for an early spring on his big "coming out" day yesterday? Well, I can tell you if there were any of the furry rodents poking their heads out of their hibernation dens yesterday in my area, they most definitely did NOT see their shadow or any other shadow. The sun that would have caused such a shadow to be cast has been in hibernation itself for many days now. All the same, good old Punxsutawney Phil, the official groundhog of the nation, apparently did see his shadow yesterday, dooming us to six more weeks of winter. His prediction was further confirmed by Big Al the Alligator of Gator Country. Big Al refused to break his hibernation by eating, thus indicating that winter isn't nearly over yet. It seems to me that every year ol' Phil sees his shadow and scampers back into his den. I ran this theory by AKH (All-knowing Husband) who snorted, "Of course, he does! It's just like the movie Groundhog Day. Where do you think they got that name? It's the same thing every year, over and over and over again. We're in an endless loop." Of course, AKH is a skeptic when it comes to animals predicting weather - or anybody predicting weather, for that matter. (In fact, come to think of it, he's a skeptic about most things.) After living with him for all these years, I'm afraid a bit of his skepticism has rubbed off on me. You see, I don't really think it matters what Big Al or PP or the Channel 13 weatherman says. The SUN says that the vernal equinox will come on March 20 this year, and the sun rules. That is the date that winter will end and spring will begin here in the northern hemisphere of our "big blue marble." And that is about six weeks from now. Hmmm...I guess maybe Phil and Al weren't so far off, after all. My husband, the non-gardener, gave me this really thoughtful gift. It is a book called Our Life in Gardens by Joe Eck and Wayne Winterrowd. I'm in the midst of reading another book at the moment, and since I'm a one-book-at-a-time kind of reader, I haven't actually started my official reading of this book yet, but it looked so interesting, I couldn't keep from dipping into it. Once I started dipping, it was hard to put it down. It seems to be the love story of the authors and of the gardens they have created and loved together. Their joint history starts in the 70s in Boston where they created a garden in their apartment. They even had chickens! Later they moved out into the countryside where they could spread their roots as gardeners, and, a couple of years after that, they found some property in Vermont which they bought. They built their house and started their garden, and they live and garden there still. Their garden is called North Hill and it is on some lists as one of the best gardens in North America. This book seems to be mostly about what that garden has taught them - about gardening and about life. After a brief introductory chapter, the remaining chapters of the book are arranged alphabetically from agapanthus to Xanthorrhoea quadrangulata, a rare and endangered plant from Australia that the pair had luckily acquired before it was designated "rare and endangered." It seems an imminently sensible way to arrange a book about gardening or a book about life. It imposes order on what is essentially a disorderly process. So what could a garden located in the Vermont of long and brutal winters have to teach me, a gardener in subtropical Southeast Texas? The plants are different, the climate is different, and the lives of the gardeners are very different from my own. And yet from my brief introduction to their book so far, I feel a real kinship. Maybe gardeners really are the same all over the world, no matter what their different circumstances. We all worry about too much rain or too little rain, too much cold or too much heat, insect pests, and, of course, weeds. In the end, we are all attempting to create something of beauty in our gardens and in our lives. I think that's the central lesson that Our Life in Gardens has to teach. Just like the flowers at North Hill, we can't "all be marigolds." But we can be ourselves and that's even better. Do you know what the second most popular hobby in America is? If you guessed bird feeding, you are absolutely correct. We spend $3 billion per year on bird seed. That is a lot of bird seed! 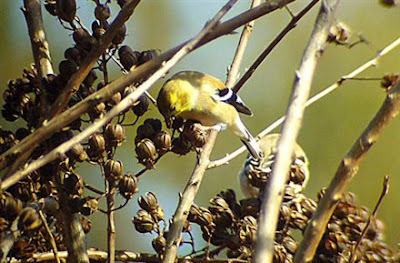 Some of us keep our feeders stocked twelve months of the year, but there is no month when those feeders are more relied upon by the birds than in February. 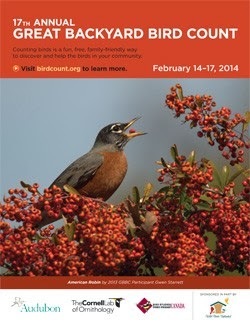 For that reason, February has been named as National Bird Feeding Month. 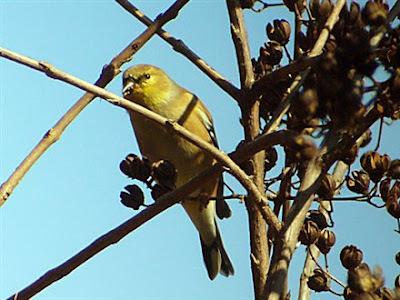 In February, we are reaching the mid-point of winter and most of the wild food that many seed-eating birds depend upon has been exhausted, at a time when much of the country is still facing harsh weather conditions. While harsh weather is not a serious obstacle for most birds, lack of food certainly is, so it is now more important than ever that those bird feeders be kept stocked with high nutrition food. Some of the best foods include suet, peanut butter, peanuts, sunflower seeds (especially black oil), and safflower seeds. 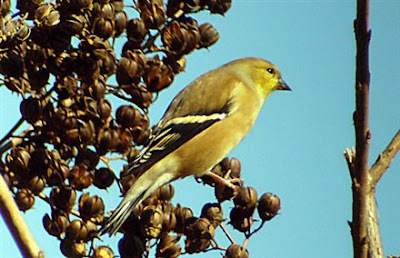 Add thistle seeds for the finches and you've got a smorgasbord to which seed-eating birds will flock from all over your neighborhood. When I open the door to my backyard early in the morning on these winter days, literally hundreds of birds fly up from the feeders and the ground under the feeders. 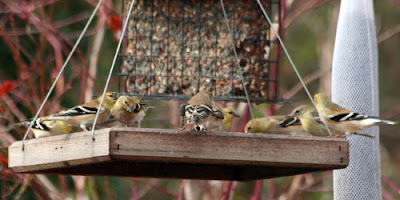 A majority of these are goldfinches, but there are also sparrows, warblers, and doves. It is a most gratifying sight and all the encouragement I need to keep the bird seed flowing. I hope that you are keeping your birdfeeders well stocked, also, or if you haven't put up a feeder yet, there's no better month than this, National Bird Feeding Month, to do so. The birds will thank you for it. 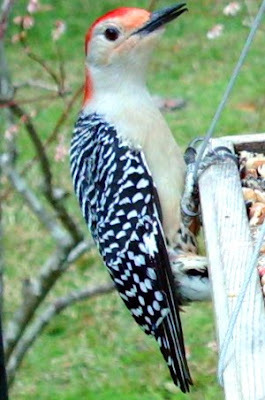 A male Red-bellied Woodpecker has a snack at one of my backyard feeders.